There are several species of wild rabbits--most are called cottontail rabbits--who, between them, live across most of North America. 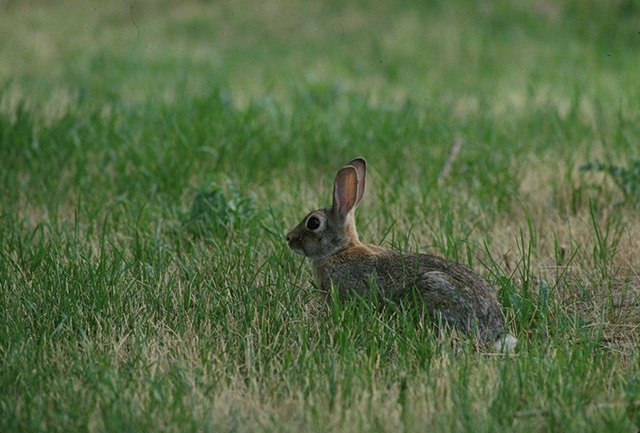 Cottontails like to live at the edges of open areas. In fact, they are rarely found in dense forests or open grassland. Deer eat many of the same things rabbits do and are also common around yards. Twigs browsed by rabbits look neatly clipped but plants browsed by deer appear ragged and torn. You may see the easily recognizable tracks of rabbits in soft soil or snow. And you may see the rabbits themselves--a dead giveaway to their presence--most often near dawn and dusk. Barriers for flowers and vegetables: A well-constructed fence is the most effective way to protect plants. Two-foot high chicken wire supported by posts every six to eight feet is strong enough to keep rabbits out. Stake the bottom securely to the ground to prevent rabbits from pushing underneath it. Barriers for trees: Commercial tree wrap or plastic tree guards can keep rabbits from nibbling bark. Cylinders of hardware cloth (stand on their own) or poultry wire (need staking) can work as well. These barriers should be as high as usual snow depth plus eighteen inches. Young trees and saplings are more vulnerable so focus on protecting them. Repellents: In some places, fencing won't be practical or damage will be so slight that a fence isn't cost effective. Then chemical repellents can protect small plots and individual plants. Don't use a repellent on plants that people will eat unless the label specifies it is safe to do so. Scare Devices: Sometimes, scare tape or balloons might frighten rabbits away from an area. The pinwheels sold to repel moles might provide a look scary to rabbits as well. Habitat Modification: Remove cover (vine thickets, tall grass, and shrub cover) around gardens and orchards so rabbits don't have escape cover. They will spend less time (and eat less food) where they feel unsafe. Think, however, about the potential negative effects on other species that could benefit from a naturalized back yard.